An acquaintance was married last month and sent the link to her wedding pics. I was captivated by the photographers' site, which provides a window into dozens of stylish weddings. Most weddings they sh ot were classics: graceful brides in frothy dresses, matching bridesmaids, dapper grooms in formal wear. Amid radiant newlyweds, one couple, Jenny and Lee, stood out. 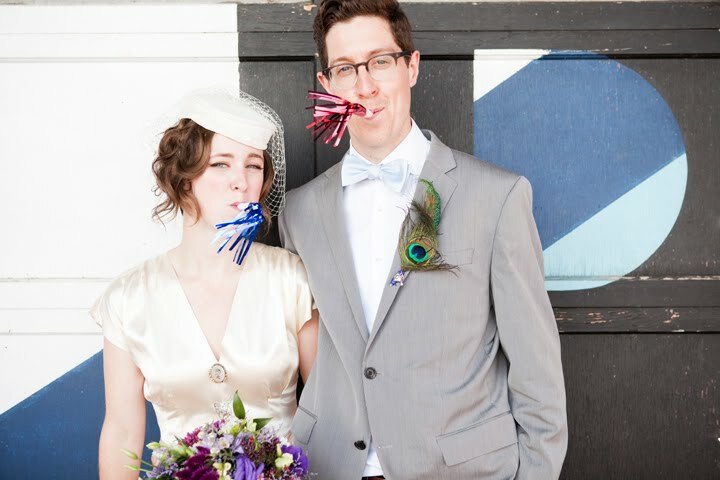 From his peacock-feather boutonniere to their noisemakers, these two were quirky. I've cringe d at some "creative" weddings (everyone in swimsuits on a beach, for example); this couple's seemed respectful of the occasion, yet whimsical. I admired Je nny's '40s ecru silk peplumed dress and veiled pillbox, an alternative to the extravagant bridal costume. Her softly waved hair looked so easy and elegant. All brides are beautiful; Jenny has style as well. And the groom! 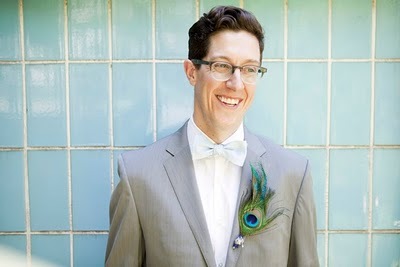 Pale grey suit, softest blue bow tie, a lighthearted retro effect for an afternoon ceremony. The father of the bride rarely pays for the wedding these days; only 17% foot the bill, compared to 44% a decade ago, according to a Wedding Inbox study. Since so many brides and grooms fund their own celebration (or their families share the cost), couples are rejecting one-wear wedding attire. I wish Jenny and Lee a joyous future. 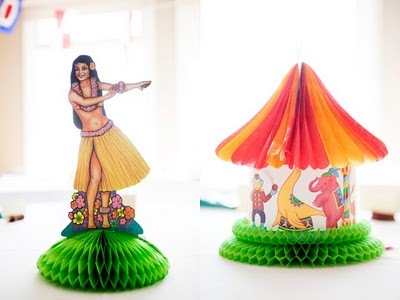 A couple whose wedding features a reading from "Gift from the Sea" and "The Velveteen Rabbit", hula centerpieces and noisemakers seem to have a head start. 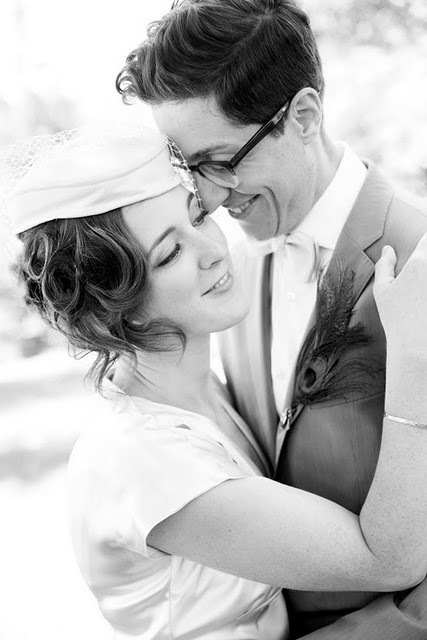 Duchesse - There's quite a trend these days of 'indie" weddings that are similar to the one you found. www.apracticalwedding.com showcases lots and lots and lots. Also hosts a discussion for intelligent and independent young women. Kind of fun to eavesdrop:). Daughter #1 wore a long dress, but not a white one, no veil either. My favourite shot from her wedding is of groom helping bride out of the floatplane (wedding was in the city to accommodate older rellies; reception was at our beach). Daughter #3 is going a different route with a much smaller wedding(immediate family & grandparents only) in a much more formal setting (private club she and the groom have a work history with). She would have preferred a bigger affair, but we set the same modest budget as funded the (catered) barbeque and salads do for her sister -- and it simply didn't go very far in fancy club. . . I've got serious reservations about the money that gets spent on rings and gowns and sundries of all kind, so I love the examples you've dug out. We've tried, and will try, to hold a very modest line, especially given how much has gone into funding educations. And personally, I'd rather have a good party on a modest budget and contribute to a down payment on a first home . . .
My daughter is planning to wear the Chloe dress I blogged about last year. Will post pics when/if the day comes...no groom on the horizon at the moment. The couple is very snazzy. How lovely to see such joy and originality all in one place! I like to hang out on A Practical Wedding, too -- and for even more fun, there's the Offbeat Bride site, with large doses of both love and tats. LPC: Thanks for the pointer, and applause to these women! I think the traditional wedding is a massive scam. Pew bows, come on! What I still do not 'get' is why any bride (young or not) would choose an exquisite, usually expensive dress and then wear it once. materfamilias: You will post photos, won't you, please? Looking forward already. Frugal: I too thought they had loads of style. I've seen some indie weddings that remind me of my first one (ultra hippie, I made the dress), but this one was so polished. Yesterday I played catch-up on your posts and decided to write to you. Then everything went crazy on my computer so I literally pulled the plug. I'm back today to tell you how cogent and beautifully written each post is. You are such a pleasure to READ, not matter what your subject -- always well chosen and interesting-- but most of all I love you style. It's lovely to have you in my virtual world. Tish: Sorry I'm so late responding, I've been away. Thanks so much for the kind words and encoragement, means a great deal to me.